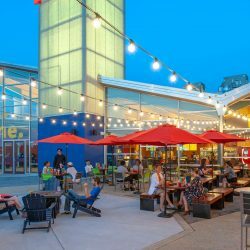 Wyomissing, PA: Wyomissing, PA-based Fox Theatres announced this week the grand opening of Fox Patio at Fox Berkshire, 800 Berkshire Boulevard in Wyomissing, Pennsylvania. The stunning new 45-seat outdoor dining area, located in front of the theater’s glass enclosed lobby, opened on Memorial Day weekend and will kick-off its official grand opening with a weekend series of free live events beginning Thursday, June 28. Now, in addition to enjoying made-to-order food and signature cocktails in the lobby or auditoriums, moviegoers can relax with a drink and dine outside before, or after, a movie or even come just to enjoy the festive patio, no ticket required. Under a string light canopy and red cafe umbrellas, Fox Patio features a mix of seating options including dining, high top and communal tables, as well as a fire pit surrounded by deck chairs. New landscaping provides a buffer from the parking area to fully enjoy the dining scene. Since 2012, when they re-acquired Fox Berkshire from Carmike Cinemas, admissions have more than tripled as Fox Theatres has completed upgrades throughout the complex – highlighted by luxury recliner seating, the FTX large format screen and Fox Kitchen & Bar.